The Latin American tradition of “el Dia de Los Muertos,” has crossed over to the U.S. as Day of the Dead (DoD) Celebrations are in more cities and cemeteries than ever before. One can find DoD items at Williams-Sonoma, Cost Plus World Market, Target, Michael’s, and several other stores. The day has been commercialized and is now part of big marketing just like Halloween and other holidays. I have mixed feelings about all that and hope the tradition doesn’t get lost through merchandising. I don’t want people to think that DoD is Mexican Halloween because it isn’t. You might wonder what’s up with Mexican culture and death. And how did the celebration come to the U.S? This is a story as old as immigration and ancestral traditions. In the 1970’s Latino activists and artists in the United States began expanding “Day of the Dead” north of the border with celebrations of performance art, Aztec dance, art exhibits, and other public expressions, namely the construction of the altar. This tradition, embraced by the mainstream, builds community, gives awareness for other traditions, and helps maintain ancestral and cultural identity. There are several icons which constitute a Day of the Dead remembrance. Recently, museums across the nation have begun to embrace this tradition as a means of engaging more diverse audiences and highlighting how Latin Americans view death, in contrast to Anglo-Saxons. My county museum has been celebrating Day of the Dead for several years. This year, I and several others are building an altar to the Mexican and Mexican American film stars of the past 100 years, as a precursor to a film festival we’re hosting next year. 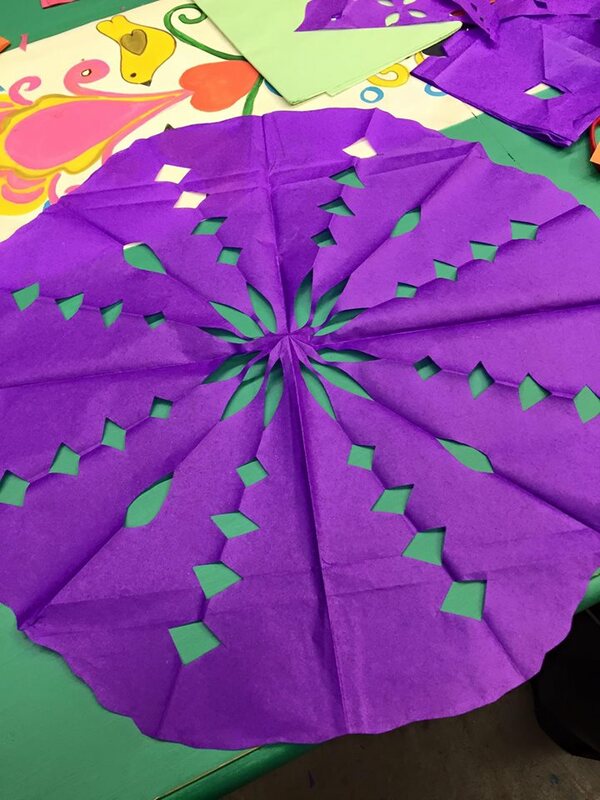 First we had to fold and cut a lot of colorful crepe paper to decorate the three levels of the altar. I’m a craft klutz, but with some individual help, I was able to construct a few papeles. As you can see, just building the altar brings a group together. Over the next few days, we’ll gather the elements needed to symbolize the four elements: wind, water, earth, and fire. 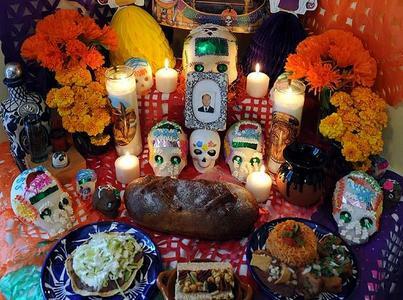 Bunches of cempasuchil (marigolds), photographs, jarros (earthenware jugs or cups), candles, salt, pan de muerto (bread of the dead), sugar skulls and a few other objects. Here’s a close-up view of a small altar. Example of Day of the Dead altar. Expand your horizons and visit a Day of the Dead celebration in your area. Previous blog entries have described this “new” ancient tradition of skulls, marigolds, altars and memories. If this day is new to you, the best way for you and your children to experience the tradition is to attend an event this weekend. Talk about the meaning of this day and that it is okay to talk about the deceased. There are so many memories parents may have of their parents, uncles, aunts, best friends, grandparents or great grandparents. And one of the second best ways is through storybooks, like the one above. I just read about this book this morning and visited the author/illustrator’s site: Muertoons. I’m their newest fan. The vibrant illustrations of ROSITA Y CONCHITA and the sweetness of the story make this storybook a keeper. Encourage children to talk about their losses, their memories. Listen to their stories. And if you can’t make it to an outdoor celebration, you can always light a candle by a favorite photo of your loved ones who’ve passed, listen to their favorite songs, give them a toast, and let them know you remember them-always. 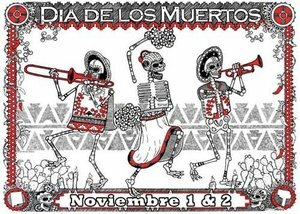 Feliz Day of All Souls or Dia De Los Muertos (DDLM). The last two days have been a whirlwind that rivals the 75 degree Southern California Santa Ana winds that we have today. I began NaNoWriMo on November 1st, while getting my micro mini bookstore, The BookNook, ready for opening this afternoon. The last week has been dedicated to unpacking books, retail labels, printing bookmarkers, and all that kind of stuff. I had the nerve to take off to Los Angeles yesterday evening to catch “Come Fly Away With Me,” at the Pantages, in a quest to relax before opening day. Ten minutes before the curtain rose I received a text that my cake pop treats would not be ready for me today after all, ‘so sorry.’ There was a problem at their bakery. I moaned and groaned (not in the text), said a prayer and began searching for other bakery numbers. Everyone was closed for the evening. Curtain rose, the musical was non-stop dancing to Frank Sinatra songs and I was taken away for 80 brief minutes. Turned my phone back on and a sweet mini-miracle, the bakery texted, everything fixed, your order will be ready. I call the BookNook micro-mini because it is within a consignment shop, very nice, where I rent a small space for new and ‘gently read’ books. 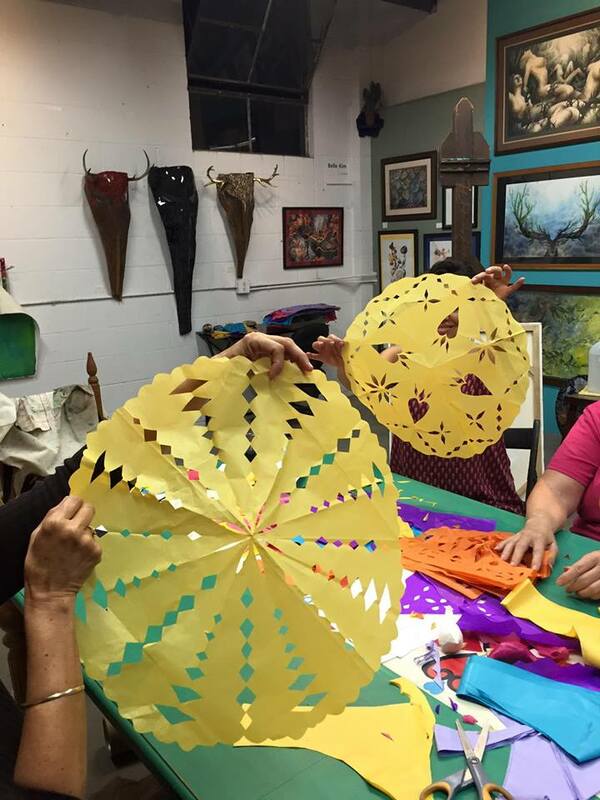 At the shop today is a DDLM commemoration and local artists will build an altar within the store for the community. People are free to bring candles, sugar skulls, marigolds, papel picado and Pan de Huevo. Before I take my crates of books to the car, double check on my cake pops, and gather up my equipment I thought I’d post some references from my favorite sites on “Character” building for those who are interested in using this information for their NNWM challenge. (I’m already behind with only 1,643 words, but there are 28 days left). Writer’s Digest did a good job on How to avoid Parenting your Characters. If you haven’t visited Holly Lisle blog now is a good time to follow her and pick up some valuable pointers. IMHO she has one of the most helpful blogs for writers. Over at Kirsten Lamb, who is also a wealth of information and who collaborates with many authors to provide great info, is her article for creating legendary characters. After my bookstore opening I hope to come back and do some more NNWM words. But in between what I hope are many customers, I will be over at the DDLM altar saying some prayers for the departed and enjoying some Pan De Huevo.